There is a great demand for the development of novel anticancer drugs, due to the increasing morbidity and high mortality of cancer. To date, chemotherapy still plays a central role in the clinical treatment of cancer, but this role is being reduced by targeted therapies. Since cancer is a complicated and multiple genes involved disease, drugs that act at multiple targets can enhance efficacy and lower drug resistance, and are thought to be the future of novel anticancer drug development. In this paper, we discuss the recent development of “single molecule, multi-target” anticancer agents that combine two or more pharmacophores in a single molecule, including organic multitargeted anticancer agents and metal based complexes such as platinum, ruthenium, iridium and rhodium complexes. These efforts will contribute to clinical cancer therapy and benefit patients in the future. Keywords: Anticancer agents, Multi-targeting, Drug development, Precision medicine, BCR-ABL, Cytotoxic anticancer drug. 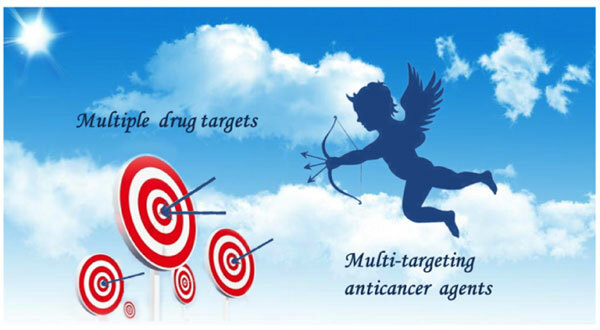 Keywords:Anticancer agents, Multi-targeting, Drug development, Precision medicine, BCR-ABL, Cytotoxic anticancer drug. Abstract:There is a great demand for the development of novel anticancer drugs, due to the increasing morbidity and high mortality of cancer. To date, chemotherapy still plays a central role in the clinical treatment of cancer, but this role is being reduced by targeted therapies. Since cancer is a complicated and multiple genes involved disease, drugs that act at multiple targets can enhance efficacy and lower drug resistance, and are thought to be the future of novel anticancer drug development. In this paper, we discuss the recent development of “single molecule, multi-target” anticancer agents that combine two or more pharmacophores in a single molecule, including organic multitargeted anticancer agents and metal based complexes such as platinum, ruthenium, iridium and rhodium complexes. These efforts will contribute to clinical cancer therapy and benefit patients in the future.